Are you a photographer? Would you like to win a helicopter photo ride with doors off? Here is your chance. 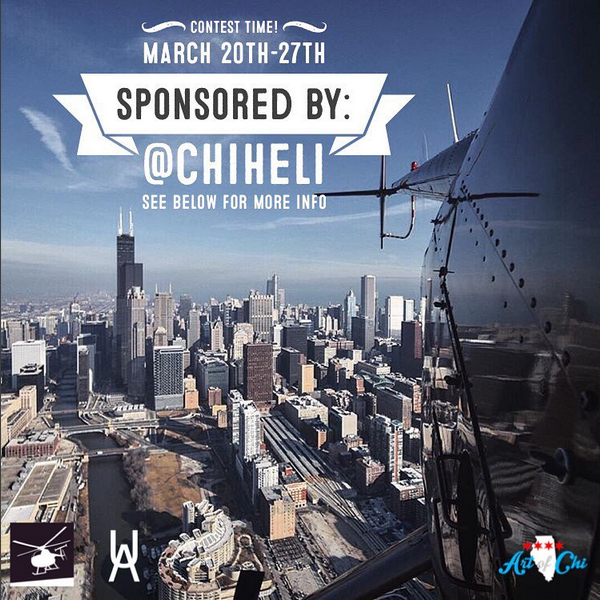 Chicago Helicopter Tours’ Instagram account @Chiheli and @Art.of.Chi bring you this photo contest. Contest begins Sunday March 20th and ends Sunday March 27th!Learn more about this Instagram photo contest here! ** REQUIRED caption should be: #AOC_HELI Free Flight @chiheli x @art.of.chi · Tag 3 or more friends on this post · Unlimited entries permitted – your profile must be set to Public view · Contest begins Sunday March 20th and ends Sunday March 27th – Winners will be announced on Sunday, March 27th at 7:00pm CST · Winner must provide name, e-mail address, and phone number at time of winning · Prize: Free Custom Helicopter Tour from Chicago Helicopter Tours. You will go on a helicopter photo ride over downtown Chicago with the doors off! Now let’s get those entries submitted!